Like so many “traditions” in the City, scratch the surface and you will find that they were only established relatively recently. This is true of the Ceremony of the Presentation of the Lord Mayors hat by the Feltmakers’ Livery Company. It was initiated by Sir Hugh Wontner in 1963 when he was Master of the Company but has become an annual fixture in the calendar of the Lord Mayor and the Feltmakers’ Company ever since. How wise he was to establish this special rapport with the newly elected Lord Mayor and Lady Mayoress. Other Liveries, such as the Fruiterers and the Fanmakers, make annual presentations to the Lord Mayor or the Lady Mayoress, but none get their “foot in the door” of the Mansion House so early and therefore make their mark so memorably and effectively. What is more, the Lord Mayor keeps his hat after he steps down, so the memory lives on once his year in office is over! The ceremony itself is a relatively simple one. 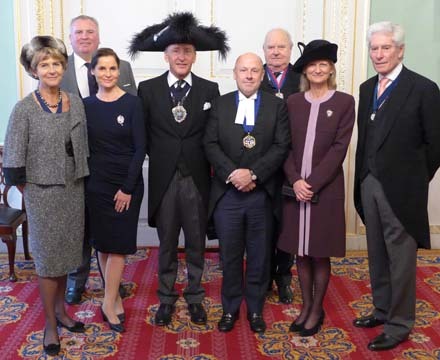 This year, the Master and Clerk and the Wardens were invited to the Mansion House on November 14th, the very next day after the Lord Mayor’s Banquet. We all arrived punctually, just before midday, to be ushered up to the Parlour to await the arrival of Charles and Samantha Bowman who were introduced to us by Tim Rolph, one of the Programme Managers at the Mansion House. Our Master, Nicholas Hilliard, then made the official presentation of the hat to the Lord Mayor who had already received his hat at the Silent Ceremony on the previous Friday, and worn and waved it at the Lord Mayor’s Show on the Saturday! In another time-honoured tradition, a tray of champagne glasses then appeared, with which to toast the success of the forthcoming Mayoral year. In all, the ceremony lasted about half an hour before the Lord Mayor was escorted away to take up his hectic schedule, while the Clerk and the Wardens jumped into taxis and made their way to the Garrick Club, where they were entertained to a delightful lunch by the Master and his wife, Jane.